In May and June we've been establishing several new gardens, with clients all around the place. The rainy weather has put a bit of a dampner on some of the construction activities, but hasn't stopped the efforts of Juliet, Christina and our intrepid FIMBY gardeners. We have two new gardens in the one street in Tranmere, and the day we scheduled for planting was downright horrible. 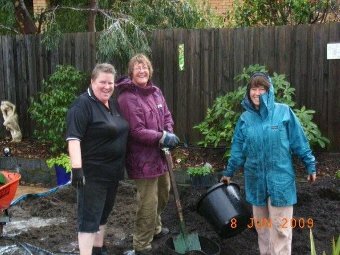 But we turned up to find our faithful FIMBY gardeners all kitted out in raincoats and gardening gloves, ready and eager. "The rain must be good for the plants, right?" was their question. Absolutely! At Helen and Marg's garden in Blackmans Bay we were lucky enough to have Helen acting as photo journalist over several weeks. Full picture coverage can be found in the "Blackman's Bay 1" album on our Garden Evolution page.